Oh life is so sweet! But, should it be sweetened with agave, honey, sugar, molasses, or Splenda? In my opinion, sweeteners that are natural seem like the best bang for your money. If we eat calorie-containing sweeteners in moderation, like agave, honey, sugar, molasses, or Splenda, we get good flavor with minimal calories. One big difference between these sweeteners is ability to bake with them. One cup of sugar cannot just be swapped out for one cup of sweetener. For example, to replace one cup of sugar in a baking recipe, use either 3/4 cup of maple syrup, 3/4 cup honey, or 2/3 cup agave nectar and lower the oven temperature 25 degrees Fahrenheit. Also, reduce the quantity of liquids in the recipe slightly. These adjustments are needed mostly due to the second difference amongst sweeteners, the sweetness content. You may be able to use less substance than you would with regular sugar because there is a higher sweetness content. Agave nectar is an example where less amount is needed because it is approximately 1.4 times sweeter than sugar. Some sweeteners actually provide more than just yummy, sweet flavor. Honey and molasses taste good and have vitamins and minerals. Both honey and molasses contain 4% and 44% of our daily needs of iron, and 3% and 70% of our daily needs of potassium, respectively. There is much we could say about artifical sweeteners such as Splenda. Sugar substitutes are not magic weight loss ingredients. If you’re aiming to lose weight or prevent weight gain, products with artificial sweeteners rather than with higher calorie table sugar may be an attractive option. On the other hand, some research has suggested that consuming artificial sweeteners may be associated with increased weight, but the cause of weight gain is not yet known. Another benefit of artificial sweeteners is that they don’t contribute as much to tooth decay and cavities. 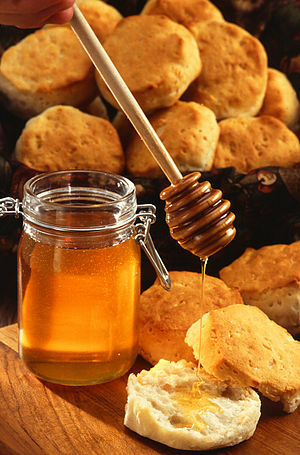 So, as you’re sweeting up your dishes, try a lower-calorie, higher nutritional content option of natural sweeteners.